Ireland’s Seamus Power has brilliantly retained full playing rights by securing the 125th and last automatic place onto the 2018/19 PGA Tour season. 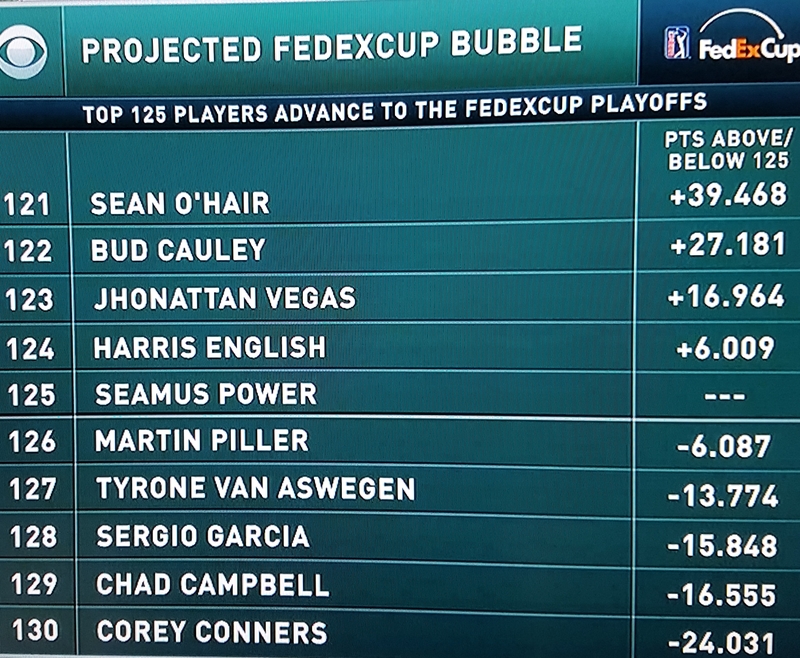 Power entered today’s concluding Wyndham Championship lying 123rd on the FedEx Cup points table but after missing the halfway cut at Greensboro the West Waterford player looking for all intention purposes missing in projected to drop to 126th on the money list. But if there is anyone Power can thank then that is 2017 Masters champion, Sergio Garcia who began the Wyndham 128th on the points table and with nine holes to play the Spaniard looked set to move ahead of Power and inside the top-125. However Garcia proceeded to bogey three of his five inward half holes and while the Augusta winning hero did birdie the 15th and 17th holes in a final round 70 for a 12-under par tally, the effort saw the Spaniard drop three places to 131st on the FedEx Cup table. It is the first time in his career Garcia has failed to qualify for the Play-Off Series. The two players to move above Power was American Nick Taylor who jumped 10 places from 129th to 119th and thanks to a final round 63 to share eighth place in the Wyndham while Harris English produced a 68 for a share of 11th and in the process jump from 132nd to 124th. Power’s125th place finish presents him with the assurance also of contesting this coming week’s first event of the lucrative Play-Off Series, the $US 9m Northern Trust Open in Paramus, New Jersey. It is the first time in his very short PGA Tour career Power has retained full playing rights and this after a year ago when he arrived at the Wydnham Championship also ranked 123rd but missed a third round cut to officially end the year 130th on the FedEx Cup standing. Power then went through the nail-biting, grey hairs process of finishing T48th in the secondardy Web.com Tour Championship and good enough to secure the 25th and final place onto to the 2017/18 PGA Tour and with the margin being just $US 487. This year Power has earned $US 745,568 in his 27 events. The proud West Waterford golfer heads to the Garden State of New Jersey buoyed by his Greensboro result to add to that sum and also in the process pick-up 25 places on the FedEx Cup standings that would qualify the Irishman for the following week’s Dell Technologies Championship in Norton, MA.